Summer’s here, West End! And with it, comes all the best things we love about living in Vancouver: beaches, sunsets, festivals, fireworks, parks, patios, and pride! This summer, the West End BIA wants you to show us your summer in the city. To enter, snap a pic of yourself and your friends doing what they love anywhere in the West End (the area of downtown Vancouver west of Burrard) and use #WEAmaze and @WestEndBIA in the caption. We’ll review the entries each week on Instagram, Twitter and Facebook and our photography editor Nelson Mouellic will select a weekly favourite. Each of these weekly favourites will be placed into a shortlist for a chance to win a brand new city bike courtesy of Denman Bike Shop. Follow the West End BIA on Facebook, Twitter and Instagram for details. Contest closes September 21, 2014. No purchase necessary to enter. Canadian residents 18 years of age or older. Why is entering so easy? 1) Like the West End BIA Facebook page and post your pic on our wall. 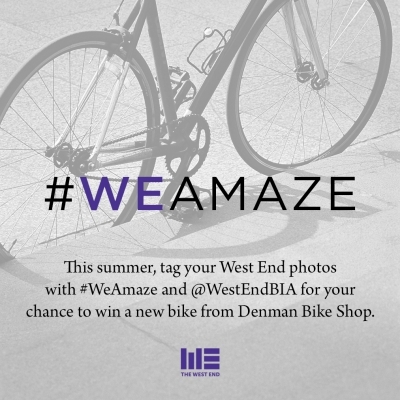 2) Post your pic to Instagram or Twitter and use #WEAmaze and @WestEndBIA in the caption. We’ll check the feeds often! * Enter as many pics as you’d like. Be sure to post your pics by 11:59pm, September 21, 2014. If your image is selected, you’ll win the following prize. GRAND PRIZE: A brand new city bike ($1000 value) courtesy of Denman Bike Shop. What constitutes a winning pic? How many pics can win? There is only one prize, so only one entry can win. When and how are winners announced and contacted? Winners will be announced on September 30, 2014. If they do not respond within 7 days, they automatically forfeit their prize. Winners must provide proof that they are 18 years of age or older to obtain their prize. How do winners obtain prizes? The prize can be collected in person at Denman Bike Shop, 710 Denman Street. Contest ends September 21, 2014, so get out there and show the world how #WEAmaze!